Despite its name, Death Valley National Park is home to an astonishing myriad of life. Located between California and Nevada, the park is made up of a below­sea­level basin and mountains with Telescope Peak reaching past 11,000 feet. That’s almost twice the depth of the Grand Canyon. Death Valley National Park, with over 3 million acres of wilderness, is the largest national park in the lower 48 states of the United States. Death Valley National Park is a great stop for hiking, backpacking, and even bird watching. Along with exploring the terrain, the park also includes several historic sites such as the Keane Wonder Mine, Harmony Borax Works, Wildrose Charcoal Kilns, and even ghost towns. Along with this, the park is home to Scotty’s Castle, a magnificent Spanish­style mansion built in the early 1900s. The castle gives visitors a peek into life in the ‘20s and ‘30s. Not nearly as grand in style, Death Valley National Park lodging has several options including the Furnace Creek Inn with a style similar to Scotty’s Castle. Along with the unique scenic views and sightseeing, Death Valley National Park has over 785 miles of roads — paved and dirt — which gives visitors a completely new opportunity for adventure. Along with cars, visitors can bike and mountain bike along with all park roads. The park is home to a variety of smaller mammals such as bobcats, bighorn sheep, cougars, kit foxes, and the Death Valley Pupfish. Though it is one of the hottest places in North America, the park houses over 1,000 different species of plants some of which cannot be found anywhere else in the world. Although its name might fool you, because of its unique history and rare biology, Death Valley National Park is not one to skip. The Ranch at Death Valley offers a rugged resort and friendly lodging inside Death Valley National Park. On the property, you will find an 18-hole golf course, three restaurants, a saloon, a large outdoor swimming pool, museum, general store and so much more. The accommodations at the resort provide ample space and are beautifully furnished. From here you will find convenient access to all that Death Valley has to offer. Book early to get the best room options. The Inn at Death Valley inside Death Valley National Park is a perfect choice for both families and couples alike. The Inn at Death Valley offers some of the most upscale lodgings in the Death Valley region, it is also located in a very scenic spot at the foot of the funeral mountains and offering stunning views of the Panamint Range and the Desert Salt Pans. Other unique amenities include tennis courts, a health spa, spring-fed swimming pool, in-house restaurant and more. Stovepipe Wells Village has everything you need to make a complete Death Valley vacation including convenient in-park lodging, eating, and shopping. Make your reservations to Stovepipe Wells today. Located in the beautiful Panamint Valley this western-themed resort offers marvelous views of Death Valley's beautiful sand dunes and the 11,000 ft Panamint Mountains. Longstreet Inn is located just a few minutes from the entrance of Death Valley National Park just outside of Amargosa Valley, Nevada. This full-service property offers guests convenient access to the park, renovated rooms, modern amenities, and great on-site amenities. The Atomic Inn is a unique tourist attraction less than 10 minutes from Death Valley National Park. 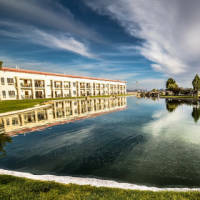 It is a newly remodeled, retro-style motel with 54 units. They offer bright, charming rooms at incredible prices. Q. Where is Death Valley? A. Death Valley is located in the south east area of California, adjacent to Nevada, with some parts of the park actually existing within the state of Nevada as well. It is sandwiched between the Inyo National Forest in California and the Amargosa Desert in Nevada. Q. Why is it called Death Valley? A. The name "Death Valley" came from a group of 19th century pioneers who lost their way while traveling during the winter of 1849. According to history, only one person perished in Death Valley, but the rest of the group was convinced that Death Valley would see the last of them as well. When they finally did make it out alive, one of them turned back and said, "Goodbye, Death Valley!" Q. What is the hottest temperature on record at Death Valley? A. The hottest temperature on record at Death Valley is 134 degrees F, which was recorded in July of 1913 at the present location of Furnace Creek Ranch. At one point, this was not only the hottest on record for Death Valley, but also for the world. It has since been surpassed by hot temperatures in Africa. Q. Is visiting Death Valley in the summertime safe? A. It is absolutely safe to visit in the summertime, as long are you are mindful of your sun exposure. It is safe to tour the sites of Death Valley in an air conditioned car, and it is wise to remain on paved roads. As a safety measure you should always keep plenty of water in your car and remember to drink plenty throughout the day to stay hydrated. It is not recommended to go hiking during the summer season unless it is early in the morning and at a high elevation. Q. What is there to do at Death Valley? A . In contrast with it's foreboding name, a plethora of different plants live within Death Valley National Park. During the spring, the flowers bloom and prosper, and tourists delight in the environment of stark contrasts, and the rich history of the area.